Kuhel WI, Monhian N, Shanahan EM, Heier LA. Epithelioid Sarcoma of the neck: a rare tumor mimicking metastatic carcinoma from an unknown primary. Otolaryngology-Head and Neck Surgery 1997;117(6): S210-213. Maas CS, Monhian N, Shah SB. Implants in rhinoplasty. Facial Plastic Surgery, 1998;13(4): 279-290. Monhian N, Greene D, Maas CS. The role of soft tissue implants in scar revision. Facial Plastic Surgery Clinics of North America, 1998;6(2): 183-190. Ahn MS, Monhian N, Maas CS. Soft tissue augmentation. Facial Plastic Surgery Clinics of North America, 1999;7(1): 35-41. Ramirez AL, Monhian N, Maas CS. Current concepts in soft tissue augmentation. Facial Plastic Surgery Clinics of North America, 2000; 8(2): 235-251. Monhian N, Ahn MS, Maas CS. Injectable and implantable materials for facial wrinkles. In: Papel, Nachlas, Sykes, et al (ed): Facial Plastic and Reconstructive Surgery, 2nd edition, New York, NY, Thieme, 2001. Monhian N, Murr AH, Mandpe AH. Oral and nasal lesions as the initial manifestations of syphilis. Archives of Otolaryngology-Head and Neck Surgery 2001;127(2):217-219. Ahn MS, Monhian N, Mass CS. A novel, conformable, rapidly setting nasal splinting material: results of a prospective study. Archives of Facial Plastic and Reconstructive Surgery. 2003; 5: 189-192. Monhian N, Jewett BS, Baker SR, Varani J.Matrix Metalloproteinase Expression in Normal Skin Associated With Basal Cell Carcinoma and in Distal Skin from the Same Patients. Archives of Facial Plastic and Reconstructive Surgery. 2005 Jul-Aug; 7(4):238-43. Monhian N, Murr, AH, Mandpe AH. Oral and nasal lesions as the initial manifestations of syphilis. Presented at the fall meeting of AAO-HNS, September 1998, San Antonio, TX. Monhian N, Murr AH, Lee KC, Schindler RA, Cheung SW. External auditory canal cholesteatoma: A review of clinical presentations and management strategies. Presented at the Western Section Meeting of the Triological Society, January 1999, Denver, CO.
Monhian N, Spiegel JH, Murr AH, Lee KC. Sinonasal lymphoma presenting as periorbital cellulitis. Presented at the Combined Otolaryngological Spring Meetings (COSM), April 1999, Palm Desert CA. Monhian N, Catten MD, Maas CS. Ultrasound guided microtip liposuction technique for removal of disfiguring silicone granulomas of the face. Presented at the American Academy of Facial Plastic and Reconstructive Surgery, September 1999, New Orleans, LA. Monhian N, Gray RF, Bikhazi N, Maas CS. Biological Response to Allogeneic and Xenogeneic Acellular Dermal Matrix Implants in Porcine Model. Presented at AAFPRS meeting at the Combined Otolaryngological Spring Meetings (COSM), May 12, 2001, Palm Desert, CA. Ahn MS, Monhian N, Mass CS. A novel, conformable, rapidly setting nasal splinting material: results of a prospective study. Presented at AAFPRS meeting at the Combined Otolaryngological Spring Meetings (COSM), May 12, 2001, Palm Desert, CA. Monhian N, Murr AH, Mandpe AH. Otolanryngologic manifestations of syphilis. Department of Otolaryngology-Head and Neck Surgery Grand Rounds, University of California-San Francisco, November 1998. Monhian N, Murr AH, Lee KC, Schindler RA, Cheung SW. External auditory canal cholesteatoma: A review of clinical presentations and management strategies. Department of Otolaryngology-Head and Neck Surgery Grand Rounds, University of California-San Francisco, January 4, 1999. Monhian N, Spiegel JH, Murr AH, Lee KC. Sinonasal lymphoma presenting as periorbital cellulitis. Department of Otolaryngology-Head and Neck Surgery Grand Rounds, University of California-San Francisco, April 14, 1999. Monhian N. Introduction to Otolaryngology. 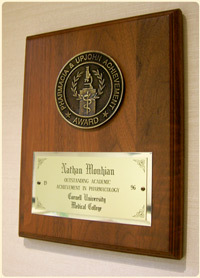 University of California – San Francisco, School of Medicine. July 8, 1999. Monhian N. Management of Facial Fractures. Department of Otolaryngology-Head and Neck Surgery Residents Conference, University of California-San Francisco, July 28, 1999. Monhian N. Complications of Rhinoplasty. Frances Sooy Lectureship presentation. Department of Otolaryngology – Head and Neck Surgery, University of California – San Francisco, June 10, 2000.